Don’t go thinking the pictures you’re going to see next, commemorating the 20th anniversary of chavismo’s rise to power in Venezuela, show the exact reality of that time. Photography never does, it’s just meant to paint a portrait of a world and give birth to it at the same time. It wasn’t easy to pick some images and leave others out. Rather than a chronological story in images of what happened each year, the search criteria was focused on observing the exact moment that often goes unnoticed and is only capable of exhibiting its true strength long after the click was made. For a photographer, every image counts. Perhaps these images didn’t say much when they were taken, but time has changed them. Memories, longing and shock stir our emotions, forcing us to review our conscience and our behavior to realize that we were a part of that image. These images make us feel that we have some sort of responsibility for each event. Maybe, we stand where we stand because of our actions, our silence, and our incapacity to react to what was happening before our very own eyes. Here are some of the most iconic and staggering images of chavismo’s first decade. 1998, Archives. Hugo Chávez registers his presidential candidacy. 1999, Archivo Radio Nacional. Hugo Chávez swears on the “dying” Constitution of 1961, implying his goal of making a new Constitution for Venezuela. 1999, El Impulso. 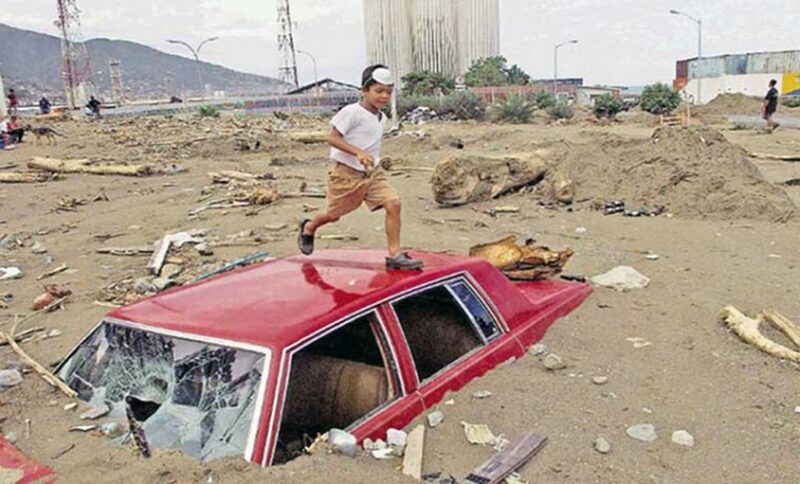 The Vargas tragedy, one of the worst natural disasters since the revolution began, took place while Hugo Chávez’s government was holding elections to validate the new Constitution of the Republic. 2000, Archive. Luis Miquilena hands Chávez the new Constitution of the Bolivarian Republic of Venezuela, after its approval on December 15, 1999. 2001, Archive. The country’s business and labor sectors, gathered in Fedecámaras and the CTV, call for a 24-hour strike on December 10, 2001, in refusal of the National Executive’s enabling laws. 2002, VTV. Chávez in his regular Sunday show “Aló President,” fires the board of directors of Petróleos de Venezuela (PDVSA) using a whistle. 2002, Archivo Diario de Caracas. The layoff of PDVSA’s board of directors causes a crisis in all sectors of Venezuelan society, which opposition parties, Fedecámaras and the CTV use to call for a march that ends up making its way to Miraflores Palace to demand Hugo Chávez’s resignation. 2002, Archive. The march to Miraflores called by opposition actors to demand Chávez’s resignation is repelled at the Llaguno Bridge, Urdaneta Av., by armed civilians loyal to the government. 2002, Archive. On the other side of the bridge, at Baralt Av., agents of the now extinct Metropolitan Police who were escorting the opposition march start shooting back toward the Llaguno Bridge, in a clash that left people dead and wounded on both sides. 2002, Archive. Chávez met with the Military High Command and other civil society actors on the night of April 11 in Miraflores Palace, to negotiate his possible exit from the Presidency of the Republic. 2002, Juan Barreto, AFP. Chávez returns to power after two days in captivity, with the support of military officers loyal to his cause. He’s returned from La Orchila Island, where he’d been held prisoner, to Miraflores Palace to resume his term in office. 2003, Archive. After the political and social unrest of 2002, sectors that opposed the government, Fedecámaras and the CTV called for an oil strike that lasted 67 days, in an attempt to oust President Chávez, which caused serious food and public service shortages in the entire country. 2004, Henry Tesara, Venepress. Danilo Anderson, official of the Prosecutor’s Office, who was investigating the events of April 2002, is murdered with a bomb in his vehicle. To this day, the culprits of this incident remain unknown. 2005, Archive. Since the enactment of the enabling laws in 2002, expropriations become the new normal in rural areas. The farmers say that this is an attack on private property. 2006, Archive. Venezuela starts signing weapons contracts with Russia, ditching the U.S., traditional partners in this area. The National Assembly approves the modernization of the Armed Forces and the State buys rifles, planes and warships from the European colossus. 2008, Archive. The new monetary cone starts circulating on January 1, 2008, scraping three zeros off the bolivar, a strategy implemented by the State to quell inflation levels, which were rising due to public spending on social programs.